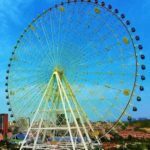 Disco Tagada ride is one of the most favored amusement park rides. 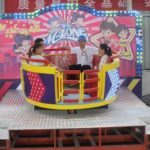 It is also known as Disco Turntable or just simply Tagada Ride or some call it as verybody thrill?and be featured in most of amusement parks all over the world. 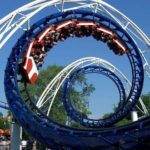 It is a type of thrill rides and one of the most popular ones, especially loved by teenagers and young adults for its disco appeal. 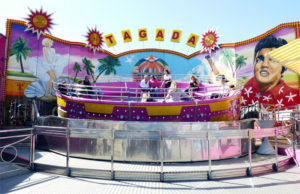 Disco Tagada rides come with various different sizes and designs. Disco Tagada ride is a fun ride, it is fun to go on as well as fun to watch and highly entertaining. 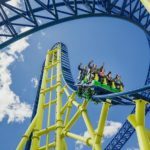 Although it is a kind of thrill rides, it doesn go as fast as a roller coaster, it doesn drop you form high up, or it doesn invert you either. It spins you on a steeply angled disc so you can enjoy thrilling excitement while feeling the adrenaline flow. However it is not as scary as other thrill rides such as roller coaster, shuttle coaster, corkscrew, cobra roll and so on. Disco Tagada is consisted of mainly the platform, and the round bowl. There is a fence around to protect the riders from get injured. The movement of Disco Tagada is not complicated and quite simple. The plate rotates in different directions and the air cylinders generate a continuous inclination. The movement of the equipment is controlled by the skilled operator. Disco Tagada rises and spins while you are bumping around along bold and entertaining disco music. It is equipped with DJ console, ribbon lights, high power stereo, flash lights and other stage equipment. You can enjoy the interaction of control personnel and shock music with huge excitement and fun. After dark time, you can enjoy the extra fun with night lights flashing. One of the most stimulating things about Disco Tagada is the fact it simulates a dance feeling and it is exactly the reason of high popularity among teenagers and young adults. 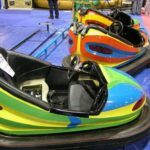 The back ground is decorated with funky scenery and special sound system and lights accompanied with it complete the perfect ride for cool, fun and thrill loving young people. This unique feeling and sensation is something you never can experience with any other fun rides or thrill rides. The thrill part comes with the fact that there are no restraints or seat belts. 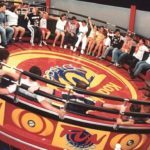 So you just sit in a round turntable without them. There are some bars which you can hold onto so it is totally safe as long as you can control yourself and keep holding onto the bars. Disco Tagada is operated by a skilled operator manually and it starts with spin and the disco music starts with movements of up and down. It is a synchronicity of the music and the bounces. Disco Tagada is also popular among young couples. Girls get scared and boys reassure them and protect them. Girls bumping around and boys catch them and hold them. Surely it will boost their intimacy. Just make sure you check and follow the safety instructions in order to avoid potentially hurting yourself.